Last Saturday’s September 10th) work day turned out to be an excellent afternoon despite weather warnings. 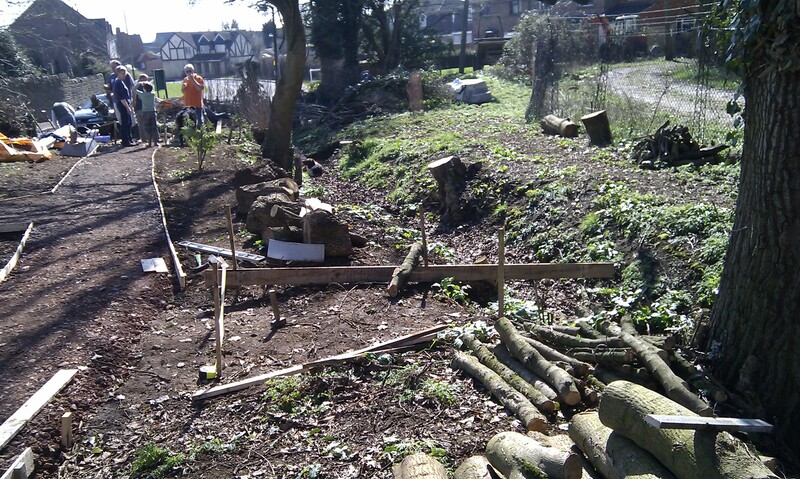 We were able to concentrate on clearing the area for the open air teaching space. We also moved so much soil that we filled a large part of the ditch where a new fence will eventually go. We also welcomed some new hard working volunteers in the afternoon who helped clear so much of the new space. Welcome to Sue and Des and to Cristina’s two sons who worked tirelessly with shovels bigger than themselves. Our thanks to everyone. The dates for the rest of 2011 are as follows. Saturdays, moving to 10am to 1pm when it gets to dark to work in the afternoon from 2pm to 5pm. To date we planted 95% of the new hedge row (with more to follow in 2012 via the Woodland Trust, we hope). We have placed the pond liner in the ground after much hard digging and are starting to landscape it. DONATIONS of flat natural stone are hoped for so that we can make the pond edges look more natural. The central island bed has been cleared despite the current crop of natural plants growing in it! We have planted many of the donated plants in temporary beds beside the ditch. Plans have been drawn to construct the two sets of bridge supports utilising money donated by the F and E Harris Memorial Trust. We are to have the oak seating via Wiltshire Wildlife Trust using money donated by the Nationwide BS. Some of our future jobs will include the building of willow hides using willow donated by Rupert Burr of Roves Farm and landscaping the ditch to allow rain water to flow into the new pond as well as replacing natural plants alongside the ditch. Verity is also organising wild-flower seeds for volunteers to grow over the coming months ready for Spring planting. SURELY THERE IS SOMETHING FROM THE ABOVE THAT YOU WOULD LIKE TO DO FOR THE VILLAGE ? Thank you to everyone who has given support to us since the project started.